"Woodstock, Revisited: A conversation with publicist Rona Elliot and official Woodstock photographer Henry Diltz” will be held at 7 p.m. Tuesday, April 23 at the Construction & Engineering Hall at The LaSells Stewart Center. The talk is free and open to the public. Elliot and Diltz’s appearance is part of the Oregon State University College of Liberal Arts’ series, “The 60s: The Decade that Changed America.” The series celebrates the cultural and artistic impact the 1960s have had on the past five decades of American life. The series was created by OSU’s director of performing arts, journalist and historian Bob Santelli. Rona Elliot has given us intimate looks at the lives of some of rock’s greatest singers, songwriters and performers including The Rolling Stones,Paul McCartney, George Harrison, Tina Turner, Eric Clapton, Aretha Franklin, Ray Charles and more. As U.S. editor of the recent “Woodstock 40,” book and multimedia boxed set, Elliot conducted dozens of interviews and organized a wealth of stories, historical documents and essays about Woodstock. Folk musician and self-taught photographer Henry Diltz’s work has graced more than 200 album covers, as well as books, magazines and galleries worldwide. His stunning stage shots and warm, intimate images of stars like Chuck Berry, James Taylor and Joni Mitchell have brought us closer to music’s most familiar faces. The LaSells Stewart Center is located at 875 SW 26th Street, Corvallis, 97331. This event is sponsored by the College of Liberal Arts. 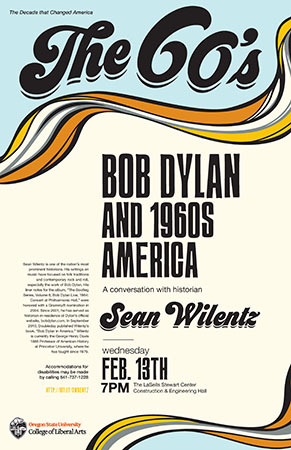 "Bob Dylan and 1960s America: A Conversation with Historian Sean Wilentz," will be held at 7 p.m. Wednesday, February 13 at the Construction & Engineering Hall at The LaSells Stewart Center. The talk is free and open to the public. Wilentz’s appearance is part of the Oregon State University College of Liberal Arts’ new series, “The 60s: The Decade that Changed America.” The series celebrates the cultural and artistic impact the 1960s have had on the past five decades of American life. The series was created by OSU’s director of performing arts, journalist and historian Bob Santelli. In September 2010, Doubleday published Wilentz’s new book, Bob Dylan in America. Wilentz’s historical scholarship has concentrated on the political and social history of the United States from the American Revolution to recent times. Wilentz is currently the George Henry Davis 1886 Professor of American History at Princeton University, where he has taught since 1979. The LaSells Stewart Center is located at 875 SW 26th Street, Corvallis, 97331. For additional information about the series visit: https://liberalarts.oregonstate.edu/60s-decade-changed-america. This event is sponsored by the College of Liberal Arts. “It was 50 Years Ago Today…The Beatles and the 60s: A Conversation with World-Renowned Beatles Authority Ken Womack” will be held at 7 p.m. Wednesday, November 28 at the Construction & Engineering Hall at The LaSells Stewart Center. The talk is free and open to the public. He is the author or editor of 35 books, including “Long and Winding Roads: The Evolving Artistry of the Beatles,” “The Cambridge Companion to the Beatles,” “The Beatles Encyclopedia: Everything Fab Four” and a two-volume biography of Beatles producer George Martin. Womack’s writing has also appeared in Salon, Slate, Variety, The Independent, The Guardian, and The Philadelphia Inquirer. Womack is Dean of the Wayne D. McMurray School of Humanities and Social Sciences at Monmouth University, where he also serves as Professor of English. He is the author of three award-winning novels, including John Doe No. 2 and the Dreamland Motel (2010), The Restaurant at the End of the World (2012), and Playing the Angel (2013). His latest novel, I Am Lemonade Lucy!, is forthcoming in 2019. The LaSells Stewart Center is located at 875 SW 26th Street, Corvallis, 97331. CORVALLIS, Ore. – “LBJ, the Great Society and the 1960s: A conversation with presidential historian and ABC analyst Mark K. Updegrove” will be held at 7 p.m. Tuesday, Oct. 30 at the Construction & Engineering Hall at The LaSells Stewart Center. The talk is free and open to the public. Updegrove’s appearance is part of the Oregon State University College of Liberal Arts’ new series, “The 60s: The Decade that Changed America.” The series celebrates the cultural and artistic impact the 1960s have had on the past five decades of American life. The series was created by OSU’s director of performing arts, journalist and historian Bob Santelli. Mark K. Updegrove is the president and CEO of the LBJ Foundation and serves as Presidential Historian for ABC News, where he appears regularly on “Good Morning America” and “This Week.” He was the director of the LBJ Presidential Library from 2009-2017 and hosted the 2014 Civil Rights Summit, which included Barack Obama, George W. Bush, Bill Clinton, and Jimmy Carter. During his tenure, he also oversaw a major renovation of the Library’s core museum exhibits. Updegrove is the author of four books on the presidency including “The Last Republicans: Inside the Extraordinary Relationship Between George H.W. Bush and George W. Bush” and “Indomitable Will: LBJ in the Presidency.” He has written for The New York Times, The Hill, Politico, The Daily Beast, Time, Parade, and National Geographic and has conducted exclusive interviews with five U.S. presidents. Earlier in his career, Updegrove served as the publisher of Newsweek and president of Time Magazine's Canadian edition.